Is the first and unique Moroccan Hammam in all Cyprus. The concept of the Moroccan Hammam was brought to Ayia Napa, in 2013 and will be accessible all year to public as of July 1st, 2013. 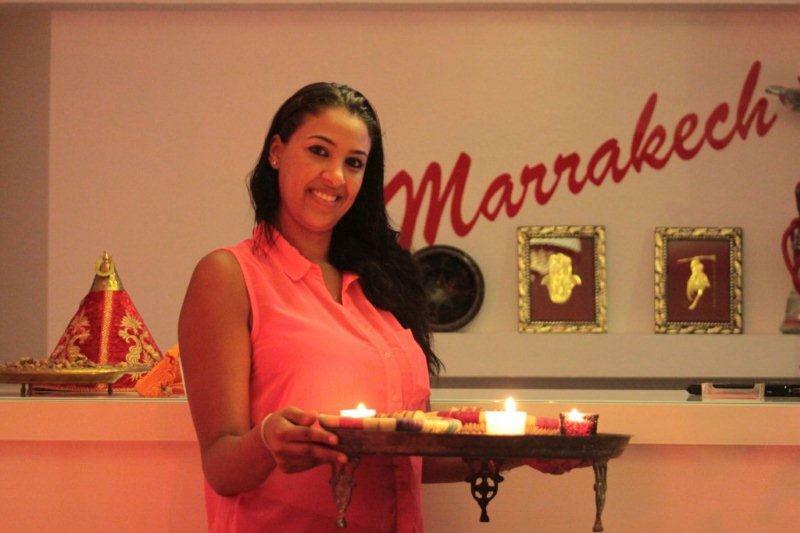 Marrakech Spa is a luxury Hammam where you can enjoy the Moroccan style decor along with the relaxation treatment provided by Moroccan specialists. At Marrakech Spa, our mission is to offer you an extraordinary journey like no other, where you will indulge yourself with an oasis retreat of the Arabian Nights, leaving the outside world behind for a unique experience of relaxation and skin rejuvenation, in a space of deep warmth and comfort. The ritual begins with hosing you down with buckets of warm water. After, your body will be slathered with a luxury black soap made of olives and eucalyptus. Once fully soaped you are left for 10 minutes to relax and breathe the lovely smell of eucalyptus and mint in the steamy Hammam. After few moments another wash with buckets of water and then the exfoliating begins. Loofa-like gloves called a Kessa is used to clean the sweaty skin of the entire residue accumulated during the day. Every inch of the body is thoroughly scrubbed to remove the dead skin before you are washed again. The next stage is the application of ghassoul clay on the entire body, a ritual very specific to Morocco that you can only find in the Middle Atlas. You are left to relax for a further 5 or 10 minutes, while the mask takes effect. The last phase of the luxury Marrakech spa treatment is the sugar and Argan oil rub with a real intense sweet and wonderful aroma. Argan oil comes from the fruit of the argan tree, which grows only in Morocco. This ensures the final remaining roughness is removed and hydrates the skin at the same time. After the Hammam treatment, one of our Moroccan and Cypriot specialists will reward you with a relaxing soothing massage session. You will be asked which oil you would prefer, but we suggest Argan oil for its benefits reputation. At the end of your Hammam session, you will be offered Moroccan traditional tea and exquisite pastries, cakes in the cooling area while watching a video projection documentary on Morocco. All around the world spa goers are increasingly seeking tradition, authenticity and an unforgettable experience when visiting a spa. They are looking for specific treatments that offer true results. The Eastern European and Middle Eastern Hammams are known to represent the latest of these trends. Hammam refers to ancient traditional Moroccan beauty rituals that Moroccan women and men practiced for centuries. It starts with cleansing and refinement in a heated chamber that combines a vigorous full-body exfoliation by a therapist who uses a coarse mitt. This is followed by a bubbly soaping and now often by a full-body massage with results that lasts for weeks. Anyone who has sampled this age-old ritual of purification will not be surprised by its rising popularity. The steam of the Hammam allows pores to dilate, for a deep cleansing of the skin. The hot water and steam stimulate the energy points and relax the muscles. This latest trend is very popular worldwide as you can extend the time spent in the Hammam and enjoy this multi-circuit bathing experience for hours. Top global spa builders and product manufacturers report a distinct increase in requests for a Hammam component in their new spa design. Hammam: is from an Arabic word meaning bath. 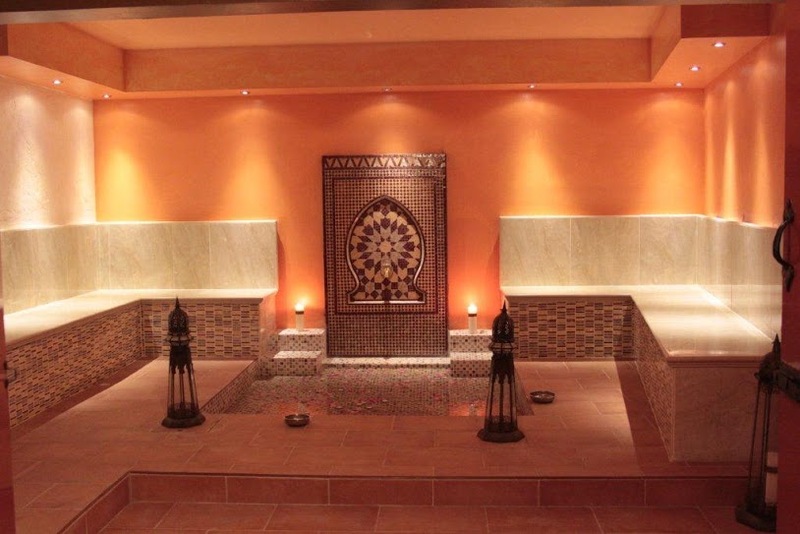 A Hammam consists of a hot room hararet, a warm, intermediate room and a cool room. These rooms are not ordinary rooms but typically architectural marvels. Massage: is a word originating from the Arabic word mass, which means touch softly. Kessa: is a loofa-like glove used to clean the sweaty skin. Ghassoul: is typical Moroccan clay that can be found only in the Atlas Mountains. The word ghassoul derives from the Arabic word for washingghassala.